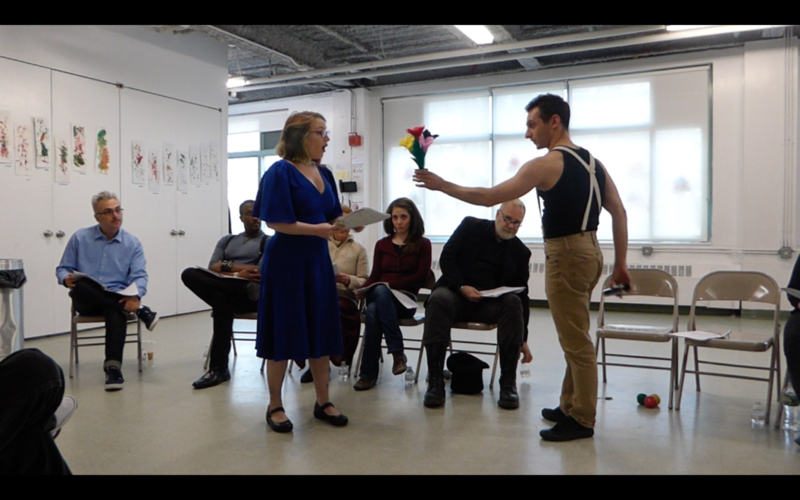 Peter Bento winning over Irene’s heart with his clown charm, captured in the Staged Reading held at the 14th Street Y in NYC, April 2017. In New York City, where I live, there is a synagogue that holds an annual tradition at their Jewish School: On Holocaust Memorial Day they bring a survivor to speak to their young students about their experiences under the Third Reich. Trying to grasp the concept of six million Jews who perished can be overwhelming, but these survivors describe the unfathomable events of the Holocaust through a more comprehensible lens: their singular point of view. They manage to compartmentalize historical events by sharing their micro perspectives, focusing on one family or relating a particular day. This synagogue understood something very important: we experience the world through stories. We are able to form a connection using the aid of personal experiences, even when the events told happened long ago or far away. But each year the task of making these events accessible becomes more difficult, as there are less survivors left to tell their stories first hand. What can be done when these personal point-of-views are, literally, dying out? My answer is: hearing testimonies from survivors is a powerful learning tool, but Experiential Education and Performing Arts can be just as powerful – and potentially longer lasting. When I came upon the story of the German-Jewish artist Irene Bento, who survived the Holocaust hiding in the German Circus Althoff, I knew I found the story I want to keep telling over and over again. Writing a theater/circus play about their story I am at the intersection of research, art and education: as a writer and scholar it’s an amazing tale to research and write about; as a stage and theater artist it is a chance to use my skills for making history accessible; and as Jewish educator I found the perfect segue for children learning about a dark chapter in their people’s history to become acquainted with a singular, turbulent, inspiring, visceral story. Soon there will be no more survivors left to tell their stories. My mission is to fill this gap with one amazing story, told not through testimony but through circus, theater and puppetry. I want audiences to find themselves empathizing with the young, Jewish circus girl who survived one of the hardest times in human history – thanks to circus and the big hearts of its people.